I often comment in these pages on my interest, as a photographer, in architecture. Both of these disciplines are art forms in their own right, but they come together with another layer of interest when one takes a camera into an art gallery. Many galleries are of themselves elaborate, artistic constructions, and the artifacts in them can be fascinating in many different and unpredictable ways, which sometimes are to do with their relationships with each other, with the building itself, or the circumstances of the neighbourhood in which the building stands. This photograph was taken earlier this year in the Lady Lever Gallery in Port Sunlight on the Wirral. The Lady Lever was one of the galleries that was pivotal in convincing me that I had to give up my first career – as an engineer – in order to study art. On visiting it again, some three decades on from that first trip, I felt a flashback of the surge of emotion I had had on seeing those gorgeous Sargents, Lord Leightons, Burne-Joneses et al for the first time. Luckily, with the work all being very old and now publicly owned, the gallery is happy to let visitors use a camera and not invoke copyright restrictions. It seemed futile, however, just to record the work – one can so easily get reproductions – so I endeavoured to look at the place as interesting space with interesting things in it, and just see what the camera could make of that. This photograph is one of many taken on the day. 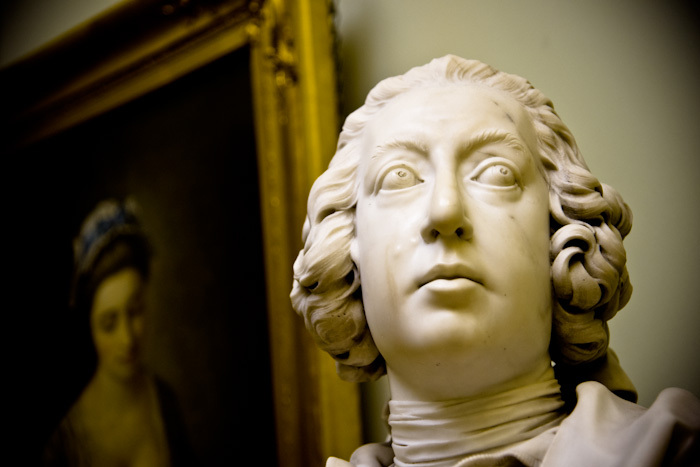 I do not know who the character is whose sculpted marble face I have recorded – though, if someone was to tell me it was George III, I wouldn’t be overwhelmed with surprise – I was just interested in the kind of would-be narrative that seemed to occur once the camera had caught him: he seems to be looking away, pensively, from the woman in the painting behind him. The camera has lifted something and re-presented it away from source. We no longer have the full story; we only have what the camera gives us. So, who knows? Maybe it is George III, and maybe we can see him here turning away from one his lovers after she has delivered some interesting or troubling news; but that may not be true at all – there may be no connection whatsoever between the sculpture and the oil painting behind it – and what I enjoy is the open-ended, potential narrative that the act of making a photograph creates. There is, of course, a lesson in this: it is said that 'the camera never lies', in that one cannot photograph what does not exist, but as this image tells us, it is entirely possible for the photographer to set up a narrative, by inference, that was never really there.